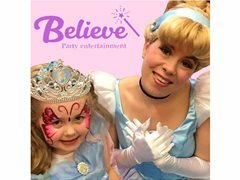 Believe Party Entertainment are HIRING a Fairytale Costumed Character Entertainer, to entertain children at birthday parties and events! I'm a small children's entertainment company and am looking to add a key member to the team. The right candidate will play characters like the "Snow Queen", "Beauty Princess", "Santa's Helper" (during Christmas season) and possibly others too. VERY competitive pay offered to the right candidate. 1. Must be full legal age to apply. 2. Must have excellent weekend availability. 4. You need to have access to reliable vehicle-based transportation (own car & driver's license highly preferred!). Transit is NOT an option. 5. Strong singing ability is mandatory and an audition performance will be required to a song that we will determine. 6. Previous experience in acting/entertainment and working with children is preferred. 7. No tattoos in visible areas. 8. My costumes fit (roughly) sizes 4-8 and heights 5'2"-5'10", you must be in that range. Auditions agreed on a flexible basis for the right candidates. 5. Strong singing ability is mandatory.